1. Eeees and I are going away for a few days. I might put up some pics of where we're going, but I probably won't be posting anything of substance to the Jewish community until I get back. 2. Be prepared for a personal announcement sometime in the next week or two. Again, strictly personal... nothing to do with the Jewish community as a whole. 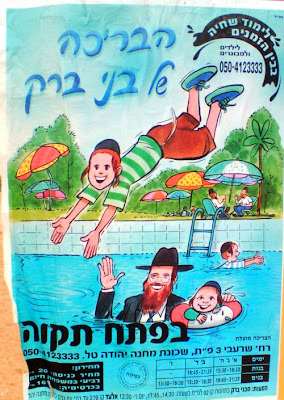 Want to go swimming in the Bnei Brak pool in Petach Tikvah? Well, then, better bring your clothing. Or so it would seem from the advertisement. Now, I'm not complaining that the advertisement has no women. Really, I understand that 100%. But it seems that we've now arrived at the point where it is not only unacceptable to show women at all, but it is also unacceptable to show men in anything less than full dress attire... even when the result is absurd. Seriously, I can understand it if they didn't want to show any bare-chested men. Really. But they could have had a shoulders-and-up view of the man in the pool. Or even just his head (with the water up to his neck). But, apparently, it seems that it is only acceptable to show a man in a pool if he's fully dressed, including shirt, jacket, tie and hat. And glasses! Oh yeah, and bare feet are no good either... the kid diving into the pool is wearing shoes! I hope the weight of his shoes doesn't drag him under. I think we've got a serious problem when you can't portray a man in a pool unless he's in full chareidi garb. After all, presumably, the men actually see each other in swimming attire when in the pool, right? If so, then how can a picture of it be any worse? Or maybe they *do* swim in full clothing? UPDATE: Yeesh! Mention "swim" in your post and all of a sudden you get the most interesting Google advertisements!. I've disabled the sidebar ad for Google until I figure out how to get it to only show appropriate ads. Thanks to those who alerted me to this. Today's Non Sequitur captures, in essence, a lot of what this blog is about. You can click on the comic to enlarge it. Interestingly, this week's Jewish Press contains two columns, which, together, illustrate a good deal of what is wrong with our Shidduch system. First up, there is Cheryl Kupfer's column, which deals with people who scuttle shidduchim for less-than-ideal reasons. She laments (and rightly so) about people who are discouraged from getting engaged to someone they are seeing for the most inconsequential of reasons. She tells of rabbanim who discourage girls from continuing a relationship with boys who either went to college or didn't stay in beis midrash "long enough." Never mind trying to figure out if she and he complement each other, if they want to marry each other, if there is some other extraordinary quality that his "college boy" my have that might make him a good match for the girl or if he was forced out of beis midrash by some economic reality. The fact of the matter is that the whole class is no good for some rabbanim. And, of course, they never actually meet the boys to try to determine if they might be good matches... all this determination is made without speaking to or laying eyes on the young bachur. And because of that misguided attitude, wonderful bachurim are having a difficult time getting married. Because of this censor-like attitude, boys who are not cut out for serious learning, who really do not have the kop or the “zitzfleish” to truly learn – are warming up benches in the beis medrash – just so they can get a “good” shidduch. How ironic that girls are being influenced to turn down “earners”– many of whom who are machmir in learning in their spare time – just to marry boys who may or may not be the genuine article. Much to their deep dismay, some end up with husbands who aren’t learning – and lacking an education or skills – aren’t working either. That state of affairs is not conducive to shalom bayis. In other words, it's amazing how people turn down shidduchim for the most superficial of reasons, without even trying to get to know the two parties involved. What would have happened if the young man hadn’t been so persistent? Indeed, what would have happened? The young girl would have been left to try to find another shidduch... which at her age and with her background, would have been difficult (and don't get me started on the idea of punishing people for things that are beyond their control... but that's a whole different post). I guess it's a good thing she asked the Rav only after going out with him. Imagine if she asked before the first date? It would have been a shidduch that was scuttled for no good reason. 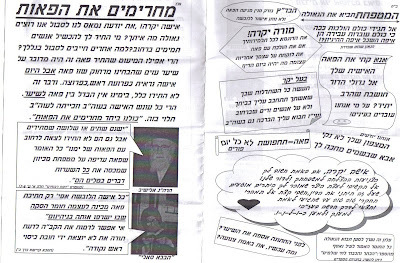 That being said, the second column, a letter to Rebbetzin Jungreis, illustrates the other side of the coin. The letter writer is a woman who has been married 25 years. She now has a 24 year old son who is receiving many impressive offers for shidduchim. Why is her son still unmarried at age 24 when there are so many girls figuratively pounding on their door? Well, as it turns out the boy became emotionally ill with a bipolar condition at 19. Fortunately, the condition is treatable by medication and today the young man is perfectly fine -- as long as he remains on his medication. So far, it's been five years and all is well with him. Well, now it's the one day when the man has met the lady, and they know that it's much more than a hunch. However, no one has told the young lady about the boy's illness. The letter writer is questioning whether or not they have to tell the prospective bride about the young man's condition. She feels that telling is the proper thing to do, while her husband wants to keep it quiet -- one mention of the world "bipolar," he fears, and his son will remain a bachelor forever. Sadly, this situation has come up more than once in the frum community. We've all heard stories about young couples that quickly get divorced when it becomes apparent that one of them (or even both!) have some illness that was covered up. I don't know how the letter writer's husband can possibly think that keeping this information secret is a good idea. How can he possibly think that deceiving a young girl about her future life partner is a good or proper thing to do? How does he think that beginning a marriage on a lie is a good thing? A household and a marriage is based on trust... and before it even starts he's plotting the undermining of that foundation. There are good reasons to consider scuttling a shidduch... and a bipolar condition is one of them. That doesn't mean, of course, that he has to just "blurt it out." He should certainly make the best case of it, pointing out and emphasizing the fact that he's had this condition under control for the last five years and that he is committed to keeping it that way. And she, of course, shouldn't just "freak out" when she finally does find out, but should give consideration to the progress that the boy has made over the years. But to keep it a secret?! Does the letter writer's husband think they can hide this forever? Or just long enough until the girl is "trapped?" Either way, it's a rotten way to start a marriage -- and a good way to ruin people's lives forever. What really irks me the most, I suppose, is the confluence of these two problems -- those people who would keep someone's serious problem a secret, but, at the same time, would scuttle a shidduch because of a kippah serugah or a college eductaion as pas nisht. Well, it looks like Shmuzings tagged me with the 8 things meme -- after I had already completed it. Nonetheless, I'm pretty sure I can do it again. So here you go... a bonus eight things about the Wolf. 1. The Wolf's favorite animal isn't the wolf. It's the hippopotamus (no, I'm serious). 2. When Eeees and I bought our house, we I took a picture of the basement and Photoshopped in a picture of an alligator. I then told our youngest daughter (then about seven years old) that it was to be her job to feed the alligator when we moved in to the house. I had her going for a few weeks (we didn't move in right away). The "feeding the alligator" bit is still a running gag in our house. 3. I delayed going to college for six months because I was afraid that if I asked my high school for my transcript, I would be kicked out and not graduate. 4. I am a voracious reader, yet I rarely use the library. I usually buy all of my books. This is because I re-read books all the time. Eeees, who for the most part, does not re-read books (although she reads quite a bit too), can't really understand why I buy books instead of borrowing them. I buy from Barnes & Noble at least once a week, and sometimes more often than that. 5. I am a ba'al kriah (the person who publicly reads the Torah) in shul and have been laining (reading the Torah) every* Shabbos and Yom Tov for the last nineteen years. And yes, I still do make stupid mistakes sometimes. 6. My favorite movie of all time is The Princess Bride. I never get tired of watching that movie. It's so rich in character, irony and quotable lines (there's *always* an occasion to quote a PB line). But I can't stand Buttercup. 7. About a ago, I made a decision to go through all of Shisha Sidrei Mishna (the 6 orders of Mishna) from start to finish. I'm currently in the middle of Niddah, which is toward the end. 8. I have some odd sensory issues. I cannot stand the sound of a cardboard box being slid across a wooden floor (I'm in shivers just typing this). Various other sounds that are perfectly fine for other people just drive me crazy. * Not "every" one, of course. Sometimes there is a Bar Mitzvah in shul, or sometimes I may go away for the weekend for a family simcha. Other than that, however, it's pretty much every shabbos/yom tov. An alert reader brought to my attention a matter being discussed on a women's only message board regarding wigs. 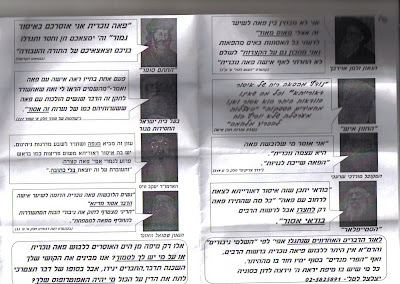 Apparently, a pashkivel is being circulated in Israel (see images at right) decrying the use of wigs by Jewish married women. We're not talking about Indian-hair wigs, where there might be a danger of Avodah Zara (idolatry), but rather any and all wigs. One time in my life I saw a woman with a wig and I said [to myself] Heaven has showed me this that I should strive to fix this problem of women wearing wigs with the hair like that of young girls'. This is forbidden. -- the Beis Yisroel from Gur. Harsh words indeed. Divorce without receiving her kesubah? Burn in hell?? Now, one thing is for certain... among Orthodox Jews, it is not the minority who permit wigs; it is the minority that prohibit it. There are many women, who are the wives of established rabbonim in communities all over the world, who belong to just about all varieties of Orthodox Judaism... chassidic, litvish, yeshivish, modern orthodox, centrist, etc. that all wear wigs. To state that is the minority who permit it is downright false. Furthermore, it's interesting how the pashkivel uses "scare tactics" to make its point. It urges men to make sure that other men won't find their wives attractive. It tells women that they are harming others (opening paragraph) by wearing wigs. It tells them that they are going to be driven from their homes without a kesubah and burn in hell. In short, do as we tell you, or else you're going to suffer for it. I'm not quite sure what to make of this. On the one hand, it seems to me that this is the work of a lone nut or a small group. A proper pashkivel would probably have had a formal text and signatures of the gedolim, which this lacks. On the other hand, do the gedolim listed really maintain these positions? And if so, then how do you account for the large number of women who do wear wigs? P.S. There is a phone number for more information at the bottom of the page. Anyone want to call for more info? 1. When in college, I started taking notes in mirror-image for no particular reason at all. I got pretty good at writing neatly in mirror-image -- a useless skill that I still have to this day. 2. As a hobby, I design board games. 3. There was a period of my life for about three years where I did not speak to my father, something I greatly regret to this day and which still somewhat overshadows our relationship. 4. I'm terribly uncomfortable in crowds, especially the type where I don't know anyone. If I'm at a large gathering, look for the person standing alone in the corner trying his best to avoid everyone. That's me. 5. I love photography. I take pictures just about everywhere. Perhaps I'll even put up a link to some of my better ones. And I love my new camera, the Canon S3 IS. It's not an SLR (can't afford one), but it's pretty close. 7. I went to a sleepaway camp (Camp Surprise Lake) for the first time in the summer of 1979. During my three weeks there, I got a small log and had all the people in the camp sign it. I still have the log and most of the signatures are still readable. 8. Before becoming a computer professional 10 years ago, I was a computer salesman/rental agent, customer service agent at an electronics retailer, Emergency Medical Technician, advertising copywriter, life insurance agent, and advertising salesman. In college, I majored in Television and Radio production, but never got a job in it professionally. Since I'm pretty sure that I'm the last blogger in the universe who hasn't done this, there's no one left to tag. However, if you've been left out somehow, consider this your tag. Many bloggers have already commented on the "Cholent Convert" story. For those of you who don't read other blogs, or may have missed it, here is the crux of the story. (Original story from Mishpacha in Hebrew here). A certain Ba'al Teshuva who had been learning in Israel for two years was eating at a kollel couple's house on Shabbos. During the meal, it became apparent that the Ba'al Teshuva did not like cholent. The kollel husband remembered reading that one who does not eat "chamin" on Shabbos is to be suspected of being an min (heretic). In addition, he also realized that the Ba'al Teshuva did not shukkle (sway rhythmically back and forth) when he davened (prayed), as many Orthodox Jews do. Upon observing these two behaviors and realizing that the Ba'al Teshuva comes from a country where Judaism is not kept very well, he reasoned that the Ba'al Teshuva must not be a Jew according to halacha. Further questioning of the Ba'al Teshuva's background turned up nothing to indicate that he was not Jewish. Nonetheless, the question was forwarded to Rav Eliyashiv, who determined that the man must undergo a giur (conversion). To me, the whole story sounds fishy on several counts. 1. The halacha regarding not eating "chamin" on Shabbos was not applied correctly. "Chamin" means "hot food" (from the Hebrew word cham, meaning hot). Only relatively recently has the term come to mean the specific food that we know of as cholent. If someone did not eat hot food at all on Shabbos, they were suspected of being a min (heretic) because it was feared that they might be following the erroneous position that one cannot use fires at all on Shabbos. The halacha here is referring to someone who specifically objects to eating hot foods on those grounds, not someone who does not eat hot food because he doesn't like the cholent, thinks it's too hot outside for hot food in the summer, or doesn't eat a specific hot food for any other reason. 2. A min is someone who is specifically Jewish -- a non-Jew cannot be a min. As such, even if he was absolutely refusing to eat the food on the basis of the fact that he held that fires cannot used on Shabbos at all and that one must eat cold food, that in itself cannot be used to show that he is not Jewish -- as a non-Jew wouldn't care whether he used fires or not on Shabbos. 3. There have been plenty of people throughout history that didn't shukkle when they davened. At least one blogger has pointed out that R. Moshe Feinstein did not shukkle. I've seen countless people whom I know are Jewish and are far more learned than I that do not shukkle. And before I continue, let me just say before some people jump down my throat, that I am sure Rav Elyashiv knows that section of shulchan aruch at least as well as me, if not 500 times better (though one does not need to be the gadol hador to quote a siman in shulchan aruch). I can understand the kollel husband making the mistake and taking the halacha in Shulchan Aruch completely out of context -- just because one learns in kollel doesn't mean that one really knows how to learn or to think critically. But if I, who is certainly no rabbi and no talmud chacham, can easily understand this, I'm sure that Rav Eliyashiv knows it as well. So, to me the whole story sounds just a bit fishy. I want more details before I swallow this one down. I seem to have misplaced my siddur. I'm fairly certain that it is somewhere in the house, I'm just not sure where. Now, you may be wondering why I'm worried about a simple siddur. After all, we must have a dozen siddurim in our house, and when I go to shul, there is always an ample supply. But, you see, this siddur is special to me. I bought it back around 1984. It was a small pocket-sized weekday Metsudah siddur. It was the type of siddur that you simply get into the habit of using -- there was nothing special about it (other than the fact that I liked the intra-linear setup) that caused me to value it over any other siddur. That was until 1994. By 1994 I was considering replacing the siddur. The lettering and cover design had long since faded to the point where the cover is just a plain maroon cover. The pages were getting a bit worn (as one might expect after ten years) and the sides of the pages and the corners had long since gone from white to dark grey. It was getting to the point where it was time to move on to a new siddur. That was when Walter got a hold of the siddur. Walter was about a year old... maybe a year and a half. He somehow got a hold of my siddur (to this day I still don't know how) and a pen. Like a true artist, he used whatever canvas he had... in this case, the pages of my siddur. The damage wasn't too bad. Some scribbles on the pages with Adom Olam, Yigdal and Brachos at the beginning and some more by Ashrei-U'va L'tziyon at the end of Shacharis. Overall, the siddur was still quite usable. But now, I found that it had a new purpose. Now I found that when I opened up the siddur at the beginning of the day to the start of davening, I found that I had a tangible reminder of some of the reasons that I need to daven. I found that by having these scribbles on the pages, I was reminded of my son (and since then, the rest of my kids as well) and it helped to give a new focus to my davening. Sadly, the siddur has been misplaced. I'm fairly certain it's in the house. If you're in my house and you see an old pocket-sized softcover maroon siddur, with no markings on the cover, my name in the front, and scribbles on some of the pages, please make sure to let me know. I miss it.